It's a well known fact that samurai warriors contained five times as much blood as ordinary humans. This would allow them to gush pints and pints of gore at the slightest nick of a samurai sword, therefore allowing them to die in the most spectacular fashion. The latest Blood Pack Total War DLC will give Shogun 2 a sticky coating of extra historical accuracy with the addition of decapitation, limb severing, blood spatters and a range of gory new sound effects. It's available now on Steam at the price of 99p / $1.59. The Hattori clan pack is also available, adding the four extra bits of DLC that Limited Edition buyers got for free on launch day. 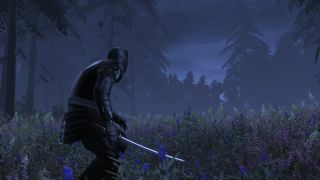 That includes the historical scenario, the Battle of Nagashino, a special armour set and bonus XP for your avatar. You also get the Hattori clan. They're masters of Iga-ryu ninjutsu, and have the most powerful ninja units of any faction. That's also out on Steam now, and costs £2.99 / $4.99. Yesterday, The Creative Assembly announced Fall of the Samurai , a massive standalone expansion for Shogun 2, with new factions, and expanded campaign map and devastating new weaponry. Here are a few screenshots of the DLC released today. The first five are from the Blood Pack, the second five are from the Hattori pack.